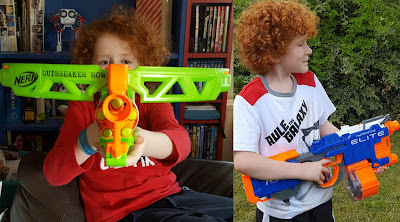 The Brick Castle: Nerf N-Strike Elite AccuStrike Series FalconFire Blaster Review (age 8+). 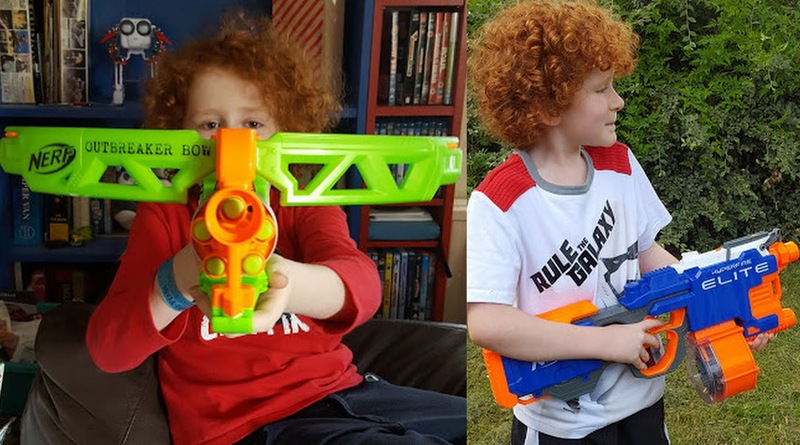 Nerf N-Strike Elite AccuStrike Series FalconFire Blaster Review (age 8+). 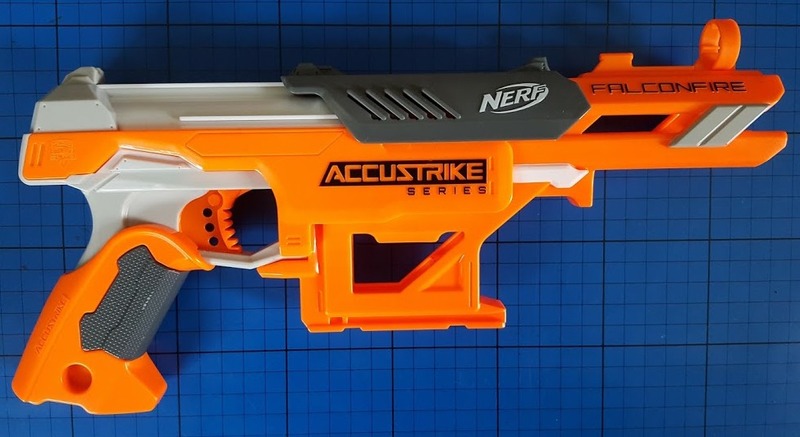 The Nerf N-Strike Elite AccuStrike Series FalconFire Blaster isn't only about the long title and the blaster, this is as much a review of the new AccuStrike darts with a rifled tip to make them the most accurate Nerf dart yet. 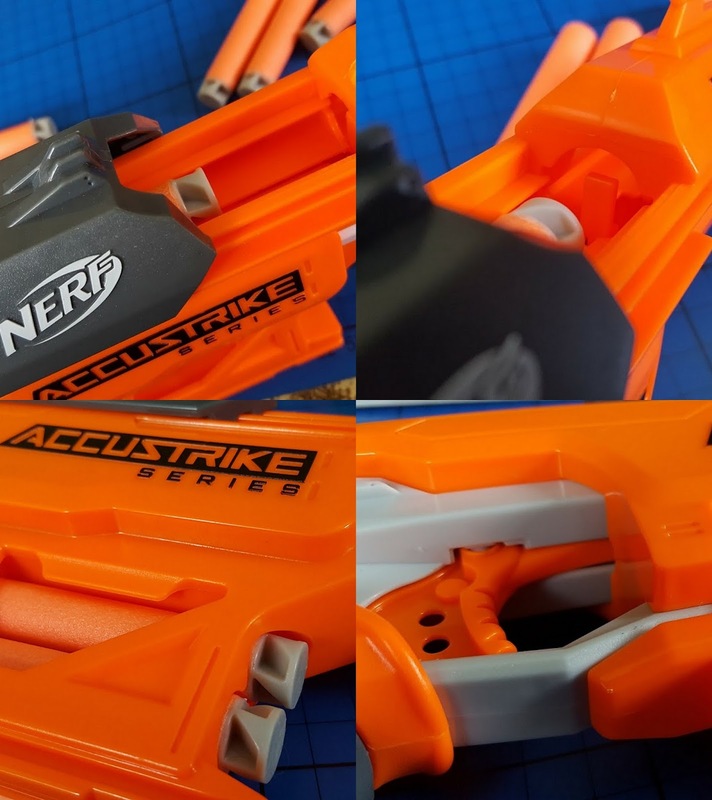 There two new AccuStrike blasters. We've been sent the FalconFire Blaster which comes complete with 6 of the new Elite AccuStrike Darts. 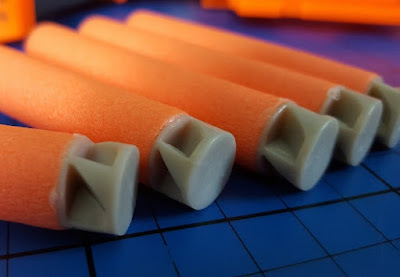 Unlike regular Nerf Elite Darts, these have a flat tip and a twisted moulding. 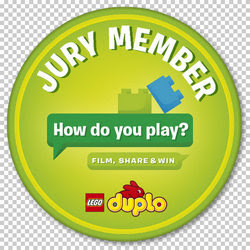 This should help them stay straighter in flight and Nerf's tests agree. They smart just a little more maybe when they hit your skin, but they still don't actually hurt, as that soft tip still has a lot of give. The N-Strike Falconfire Blaster itself is a nice standard manual action blaster. Not as forceful as some, but still plenty of power and the top-loading single shot is really quick to reload (and doesn't require a lot of hand strength), although there is only storage underneath for 2 extra darts, so accuracy is going to be essential. We're always happy to get a Nerf Blaster to review and this is no exception. 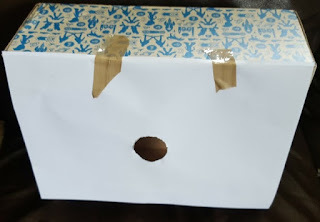 I was keen to try the new darts, so I'd already made myself a target box and spent plenty of test time playing before the children even got home from school. The hole in the paper is just made by drawing around a bottle in felt tip and pushing it out - the box is a shoe box. Only 2 direct strikes so far and they both clipped the edge of the hole, so no clean shots yet, but accuracy is good. The FalconFire is a nice, solid blaster. 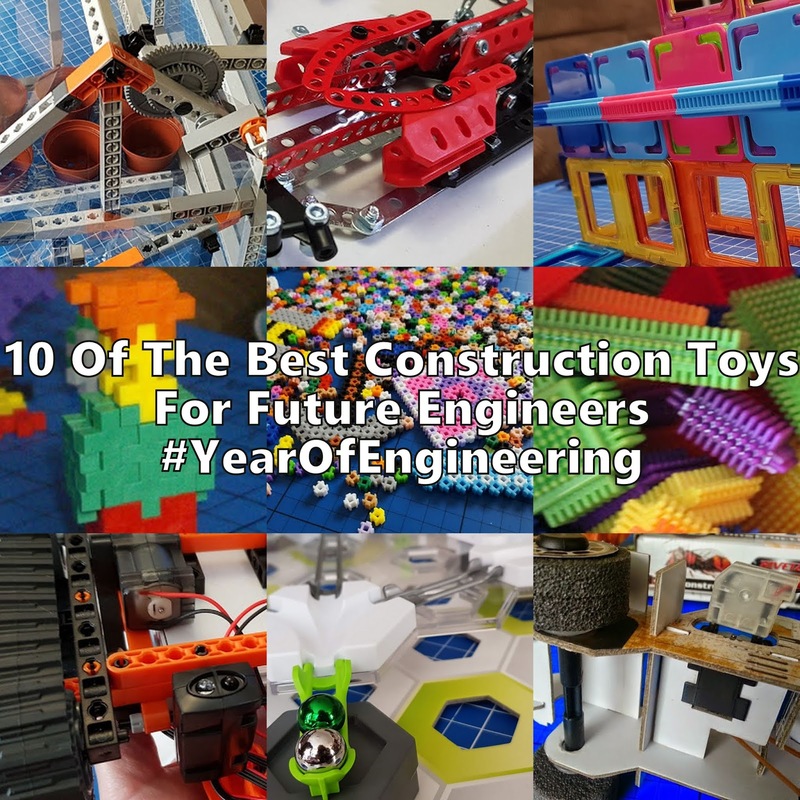 It lacks a bit of power, so accurate range is not long, but at living room length it is pretty good. 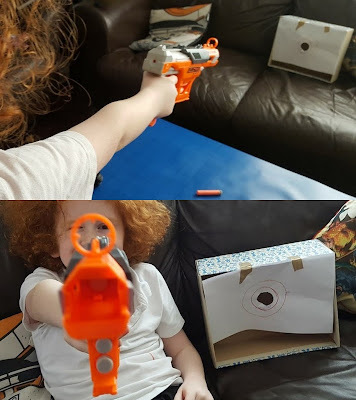 Using the AccuStrike Darts in a range of our Elite weapons the increase in accuracy isn't drastic, but does seem to be real. 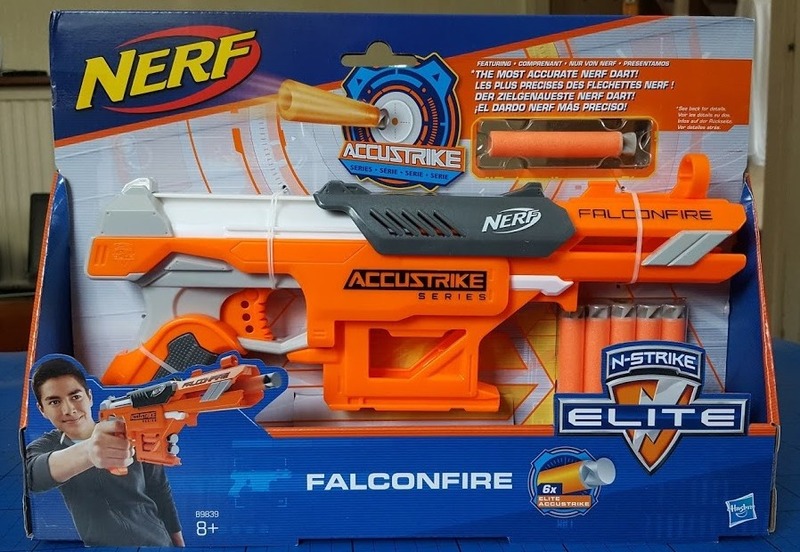 The Nerf N-Strike Elite AccuStrike Series FalconFire Blaster is available now rrp £17.99 from all good toy shops instore and online, including Toys R Us. 24 AccuStrike Darts rrp £8.99. 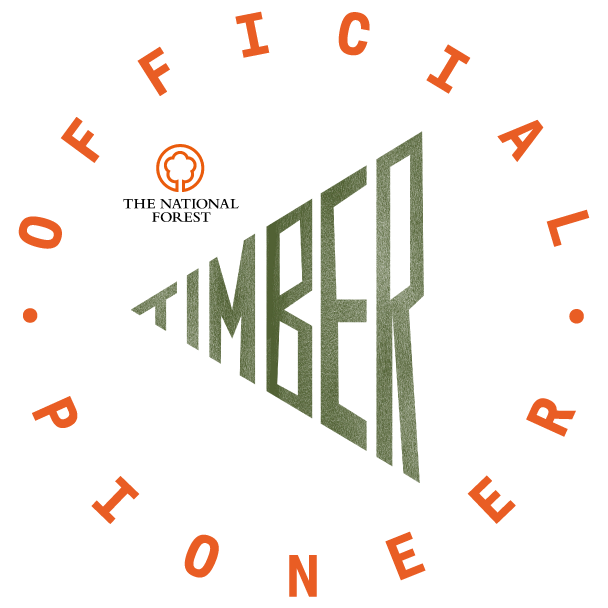 Find out more about the whole range of Nerf darts and blasters on the Nerf website. For a little more manual power and a 5 dart cartridge, try the Zombie Strike Outbreaker Crossbow. If battery-power, a 25 dart cartridge and rapid fire is your thing, we've also reviewed the Nerf N-Strike Hyperfire Elite Blaster. 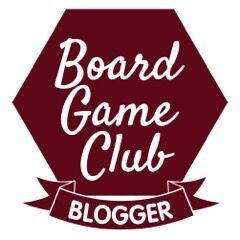 We were sent our Nerf Blaster to review as part of the Hasbro Toy Tribe.